Google Moon: Images don't show an alien there. 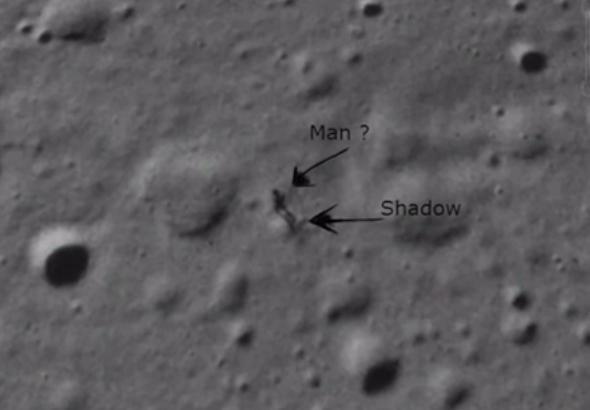 Is this an alien and shadow on the Moon? No. This is Part N in what is apparently a never-ending series of articles that have a title that starts with “No, … .” You can find more in the related posts at the bottom of this post. Update, Aug. 15, 2014 at 16:30 UTC: ARRRRG! I was soooo close. It turns out this object is actually a bit of dirt or debris that was in the lens of the camera that took it. This was in fact my first thought, but when I saw that the images used in Google Moon were from Clementine, I dismissed that idea, since the cameras used by space probes are very clean. What I didn’t know (and didn’t see in the Google Moon page) is that they also used Apollo images. The pictures in question were from a mapping camera on Apollo 15 (which is known to have had blemishes in its photos) and the link above explains the whole thing. I leave the blog post below intact so you can see my reasoning, but I also wanted to make sure you all see that I was right for mostly the right reasons, but in the end there was a critical piece of information I didn’t have—what camera was used on what mission. My thanks to Mick West on Twitter for notifying me. Right away I can tell that’s wrong. Look at the crater to the left; see how the rim is lit on the upper left, and the lower right is in shadow? That means the sunlight is coming from the lower right, and shadows are cast to the upper left. If this object is real, it’s the part to the lower right, casting the shadow to the upper left. I can see why wowforreeel labeled it that way, though; the “shadow” looks like it’s following the contour of the lunar landscape, as a shadow would. But it can’t be a shadow, as I pointed out, so that makes me immediately suspicious this figure isn’t real. I don’t think I have to make it particularly clear that I don’t think it’s an alien, or even an alien shadow. Nor is it a statue “thousands of feet high,” as one article doesn’t-claim-but-still-kinda-claims. 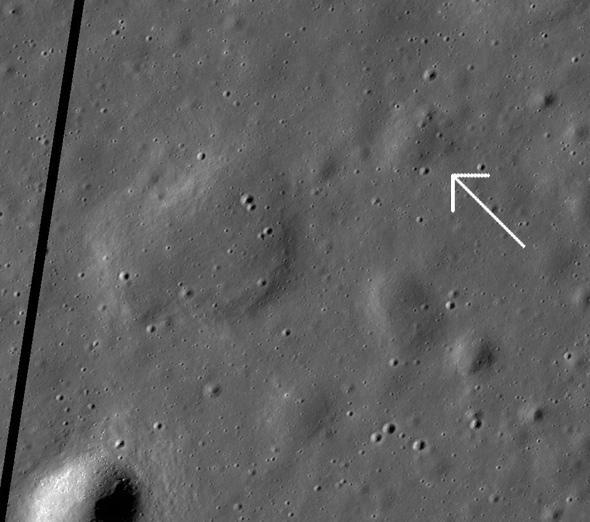 An LRO image of the Moon, with the location of the “alien figure” in the Google Moon map indicated. If you ask me how much more aliens I could see, I’d say none. None more aliens. As you can see, nothing is there (note the image is rotated a bit relative to the Google Moon shot). Perhaps the alien got bored standing around since 1994 and walked off. Incidentally, the crater to the left in the Google Moon image is also in the LRO image (cut off at the bottom). It’s roughly 350 meters across—almost four times longer than a football field. The figure is only a little smaller, so if it’s an alien, it’s a tall one. I’ll note the surface around that location is undisturbed—no footprints, tracks, or markings of any kind except dinky craters. 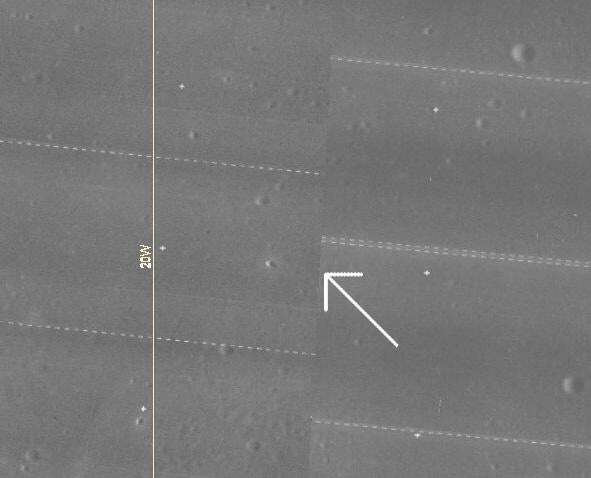 If there was something there 10 years ago, and it was removed before LRO got there and took a picture, you’d expect there to be some surface scuffling. So, to my satisfaction, this establishes the object isn’t real. But then I wondered: Is this something in the Clementine images, or is it something in the way Google Moon stitched the images together? Clementine images stitched together, showing that same region of the Moon. The arrow points to the location of the anomaly, which is right where the seam between images is. To check, I went to the NASA Lunar Mapping and Modeling Portal, found the same area … and saw that this “figure” appears very close to where there’s an image discontinuity, where different images taken at different times are connected together to make the bigger map. That makes me strongly suspect this is not in the original Clementine images but instead is an issue with the way the Google Moon software is stitching pictures together to make the map. I’ve seen that sort of thing before. So: It’s not in the LRO images, it’s not in the original Clementine images, but it is right where two images are stuck together. That’s good enough for me. What we’ve got here is a case of what’s called “anomaly hunting”—looking for things that don’t immediately make sense. If you look hard enough, especially in data you don’t fully understand or have experience with, you’ll always find something weird. But it’s a big jump from something weird to something paranormal. I’d say an infinite one. No, April 4, 2014, Is NOT “Zero G Day.” No.